Korma is a dish that originates from South and Central Asia. It has a flavor profile similar to curry and is most often prepared with yogurt, but it’s also very easy to substitute the yogurt for coconut milk, and that’s exactly what we did here. Feel free to change it around even more by going with beef or lamb instead of chicken if you’d like. The word korma itself comes from the word “braising”, but we cheated a little bit and saved on cooking time by cooking the chicken first. And while korma is often enjoyed with rice, we also decided to serve this chicken korma on a bed of cauliflower rice, but you could just as well eat it on its own too. The aromatic curry-like sauce is prepared with a great blend of garlic, curry powder, cinnamon, cumin, ginger, and coriander. Enjoy this healthy taste of India in the comfort of your home! If using the cashews as a garnish, heat a dry skillet over a medium heat and lightly toast until golden brown, about 2 minutes. Set aside. Add the cauliflower florets to a food processor. Pulse until the cauliflower is the size of a grain of rice. Don’t overcrowd or over-process, the cauliflower may turn to mush. If needed work in batches so you can keep an even consistency. Once the “rice” is made, heat 2 tablespoons of cooking fat in a large sauté pan over a medium heat. Add the cauliflower and season to taste with salt and pepper, stir to mix everything well. Continue cooking for another 5-7 minutes, until the cauliflower is just tender. Transfer to a bowl, cover to keep warm, and set aside. Place the potatoes in a pot and cover with cold water. Bring to a boil. Once boiling, cook for 6 minutes then strain and rinse under cold water. Set aside. Heat a large skillet with 2 tablespoons of cooking fat over a medium heat. Add the chicken, season to taste with salt and pepper, cook for 6-8 minutes, stirring occasionally, until the chicken is cooked through. 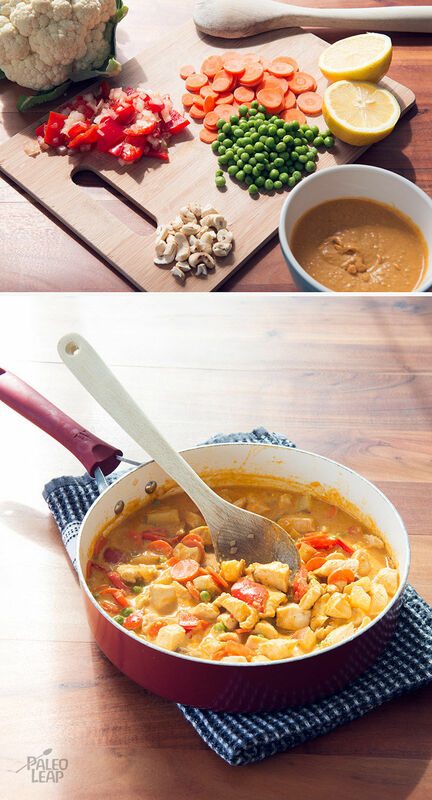 While the chicken is cooking, place all of the ingredients for the korma sauce except for the water into the food processor. Blend until smooth. Taste and adjust the seasoning if needed. Once the chicken is cooked, add the carrots, potatoes, bell pepper, onion, and peas to the pan, season with salt and pepper, and stir to mix well. Cook for 2 minutes, then add the lemon juice, stir and continue cooking for another 3 minutes. Next, add the sauce and mix. If the consistency is very thick add up to a 1⁄2 cup of water to thin it out. Allow the chicken and vegetables to simmer with the sauce for 5 minutes, or longer if a thicker consistency is desired. 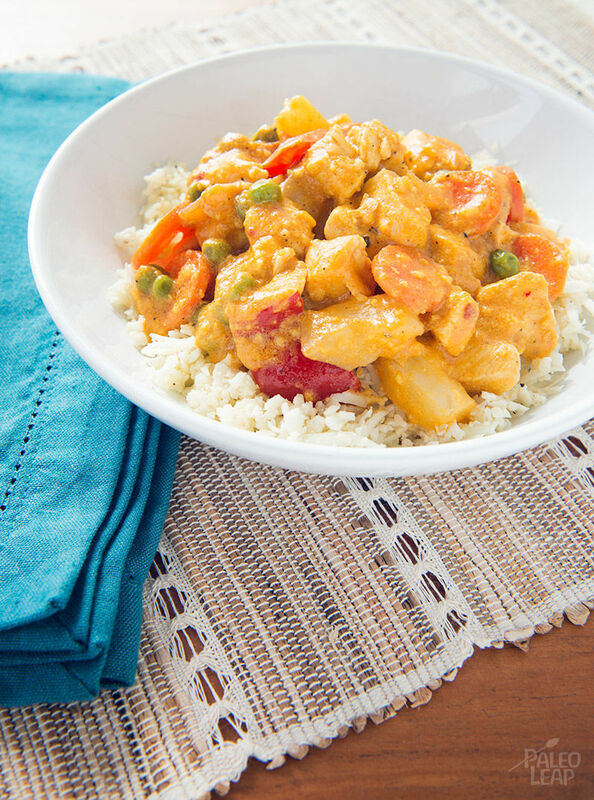 Serve the chicken korma over cauliflower rice and sprinkle with toasted cashews, if using.